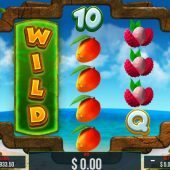 Froots slot, with the quirky spelling, immediately suggests a fun game with a not too-serious theme and that is exactly what we have. The reels are set in a wooden window to an ocean view as we hear the Calypso music and the steel drums to accompany the bright tropical theme and get us in the holiday mood. These seas don't seem to be as deadly as those Pariplay presented in their cult movie-themed Sharknado slot, but will your bankroll be in less danger too? We are faced with odd reels as froots is a 720-way game over 5 reels in a 3-4-5-4-3 row pattern like Netent's Wild rockets and similarly we get pays from right to left as well as the usual left to right. The symbols appear stacked with the exception of the Wilds although we do get a couple of Wild features in that should one land only in the bottom position of either or both reels 2 and 4 it will expand upwards. If a single Wild anywhere else forms any win, it will remain sticky for the next spin only. 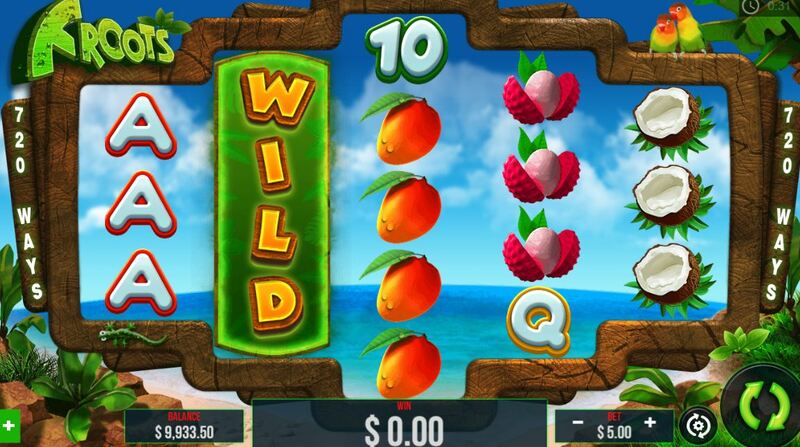 The various tasty fruits or 'Froots' of the island offer the best pays with Pineapples at 12x your 50 coin stake for a 5-of-a-kind followed by Coconuts at 6x, Papayas at 5x, Mangoes at 4x and lastly Starfruits at 2x bet for the 5. Card values make up the rest at awards of between 1 and 1.5x bet for the full 5. There is one remaining icon, the free spins scatter in the form of a neon Palm Tree. If you see 3, 4 or 5 of the Palm Tree scatters anywhere in view you gain 10, 20 or 30 free games. The amount of scatters is significant here as your 10 spins take place with a 2x multiplier, the 20 spins will be paid at 5x multiplier and the 30 free games will earn you all pays at 10x multiplier! You can retrigger them too.